Sulipund is a Velothi tower that is located to the north of Marandus stronghold, across Lake Nabia. A Mages Guild quest takes you to this remote tower to force the tower's Telvanni inhabitant to join the Mages Guild. Behind a trapped door are beds that offer rest for Telvanni retainers. Farther on, there is a makeshift bar, but no services, and some crates with clutter. Stairs lead up to the top, where you find Llarar in his study. He has a small library with a copy of Chronicles of Nchuleft, a crate with a few potions, and 100 gold on a table. 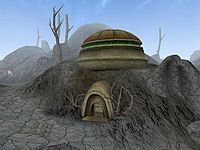 If you were here for the quest, a Divine Intervention takes you back to Moonmoth Legion Fort close to Balmora, or you can walk southwest to Punabi and use Almsivi Intervention directly to Balmora. Recruit or Kill Llarar Bereloth: Take a recruitment trip to a Telvanni in Sulipund. Dunmer Sorcerer House Telvanni Hireling(Hireling) 7 75 128 0 30 Kill or recruit him for the Mages Guild. This page was last modified on 16 April 2019, at 16:15.